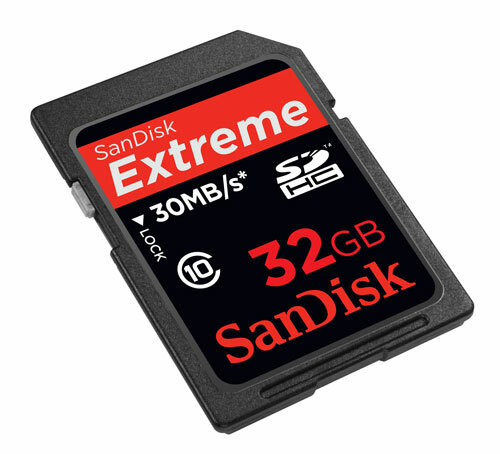 SanDisk Whips Out World's Fastest 32GB SDHC Card | OhGizmo! By Shane McGlaun on 06/25/09 • Leave a comment! One of the reasons that I bought my Nikon D80 a few years back was because it could use the SD and SDHC cards that I already had laying around. I liked the looks and features of the Sony Alpha line but didn’t want to have to go with MemoryStick for storage and the other available storage media for DSLRs was too expensive. I had to give up some write performance for my choice, but it was better than the alternatives. SanDisk has now unveiled a new SDHC card that complies with the new Class 10 specifications that offer speeds of 30Mbps for reads and writes. The 32GB of space can store 160 minutes of AVCHD video at 1920 x 1080 with a 24Mbps data transfer rate. The card is also capable of storing 2500 RAW format images. SanDisk says that the card will ship in August at an undisclosed price. The other SanDisk Extreme SDHC cards will also be bumped up to Class 10 specs.